This week's Top Ten Tuesday topic from That Artsy Reader Girl is Spring TBR. I love the TBR posts! While I'm not fantastic about actually getting them all read I do like going through my TBR and picking 10 books that I can pretend I'm going to read. It's lots of fun! 1. 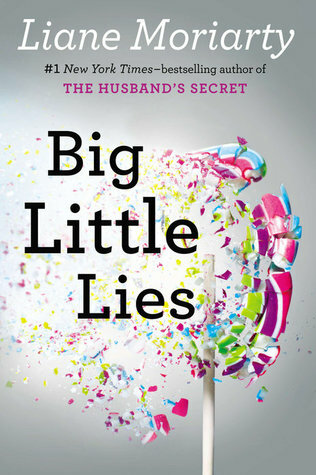 Big Little Lies by Lianne Moriarty - This one has been on my TBR for ages and when I saw my library had gotten it in audio I figured this was the time to listen to it! Now I just have to wait for it to get to my turn. 2. Family Gathering by Robyn Carr - I've really enjoyed the previous books by Carr I've read and I love the look of this one. 3. Sugarhouse Blues by Mariah Stewart - The first book in this trilogy was one of my top reads for 2017 and I'm so excited about this one. 4. Lost and Found Sisters by Jill Shalvis - I got the 2nd book in this series off Edelweiss so I figured it was time to read the 1st book. 5. The Spook in the Stacks by Eva Gates - I've been wanting to read this series for ever. It involves a library in a lighthouse and there's no way I can resist that! 6. Practical Magic by Alice Hoffman - I read my first Alice Hoffman book last year and really want to read more. This one seems to be a favorite. 7. 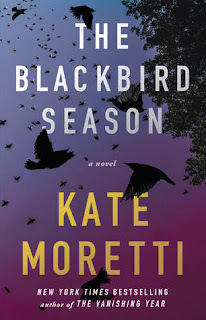 The Blackbird Season by Kate Morretti - This is another one that I've wanted to read since I first heard about it and my library just got it on audio. 8. Because of Miss Bridgerton by Julia Quinn - I love Julia Quinn but I've been falling behind on her books lately. I'm really looking forward to getting around to read this one. 9. A Man Called Ove by Frederik Backman - Another one that's been on my list forever and I've heard it was great on audio. 10. Ghost Night by Heather Graham - I love a good paranormal romantic suspense and I loved the first in the trilogy. I think it's time to get around to this one! What's on your TBR this spring:? It's great to go through your TBR and name hopeful reads for Spring. I liked A Man Called Ove on audioi, I should really watch the movie on Netflix. I enjoyed the first book in the Wildstone series by JS so will be looking forward to Rainy Day Friends publishing. You've got a great list for spring reading! Big Little Lies and The Spook in the Stacks are definitely on my reading list. And I enjoyed A Man Called Ove (both book and movie). You've got some good books on your TBR for the next three months! I've already read The Family Gathering, Because of Miss Bridgerton, and Lost and Found Sisters, and enjoyed them all—though I think the Julia Quinn was my favorite of the three. I want to read the Lighthouse Library series, and probably Practical Magic as well, but I don't think I'll get to them this spring! What a great TBR. BLL is so good!!! And so is Lost and Found SIsters. I loved it earlier this year. I want to read Practical Magic too. Happy reading! My library has a copy of Shalvis's Lost and Found Sisters. Unfortunately for many of her romance series that you like, there are random copies of installments. I sometimes let myself get a little snobby about "airplane books", which I wrote off Big Little Lies as, but I ended up really enjoying it! i just listened to Big Little Lies, all 14 parts, and I couldn't stop. I think I finished it in 3 days! So good. Can't wait to hear your thoughts. I'm so glad you're gonna read Big Little Lies! One of my favorite books. Oh and The Blackbird Season was pretty decent too. I never make it to all ten books either! Here's hoping. I think I usually hit five. :) I have a Fredrik Backman on my list this week too but it's Beartown. (Haven't read Ove yet, but we love to watch hockey so I'm intrigued with the plot of Beartown.) I hope you get to Big Little Lies, it's one of my favorites!! The audio was great. Here's my TTT this week. You will really like Big Little Lies, I think. I have read it in print and also listened to it. Caroline Lee, the narrator, is great. She also does the Kate Morton books. And yay for trying the Eva Gates book - she's also Vicki Delany and one of my favorite authors. Have fun! I have A Man Called Ove on my TBR shelf. I’ll probably read it this spring, too. I hope you enjoy all these books! It sounds like you have some great books lined up. Alice Hoffman would feature on my spring reading list also; I've yet to read her writing but heard good things. Pretend you are going to read! That's how it turns our for me most of the time. Haha. This is a great list, Katherine. I really want to read several of these too. I've read two on your list and really liked both. A Man Called Ove and Practical Magic. I hope you do get to some of these, if not all! Happy Reading!